Beginning from stark portraits photographed with a high resolution digital camera, Daniel Lee submits his pictorial subjects to the digital wringer, provoking their unsettling metamorphosis into animal-like forms. He appropriately entitled these series "Manimals", "Judgement", "108 Windows", "Origin" and "Nightlife" initially shown at O.K. Harris Works of Art Gallery in New York since 1993, in addition, these works attracted the attention of publications like PBS Television, BBC News, New York Times, American Photo, Zoom, Wired, Art Life, Harper's, Creative Technology magazines and gallery and museum exhibitions in France, Italy, England, Japan, Taiwan, Portugal, Canada, Germany, Austria and Australia. Known as Lee Xiaojing in Chinese, born in Chunking, China (1945) and raised in Taiwan. He moved to United States after he received his BFA in painting from College of Chinese Culture. Then he got his MA degree majored in Photography and Film from Philadelphia College of Art and worked as an Art Director in New York until the late seventies, at which point he changed to photography as a career. Within one and a half decades, he went through different stages in fashion, people to still life collage. Since 1993, computer technology allowed him to combine his various drawing, photographic and fine art skills in one medium. Daniel Lee's work has been shown internationally in solo exhibitions at Taipei Fine Art Museum, Taiwan (2016), National Taiwan Museum of Fine Arts, Taichung, Taiwan (2016), OCT Contemporary Art Terminal, Shanghai, China (2005), O.K. Harris Works of Art, New York (1993, 1994, 1997, 1999, 2001, 2005), the East Gallery, Taipei (2005), Nichido Contemporary Art, Tokyo (2004), CCB Center, Lisbon (1999), the Galerie du Chateau d'Eau, Toulouse (1995), the Fotofo Gallery, Bratislava (1995), both of his "108 Windows" and "Origin" in video installation have been shown in the 2003 Biennale of Venice, to be chosen as the fetured artist by Ars Electronica 2005, Linz, Austria and dOCUMENTA (13), Kassel, Germany 2012, . 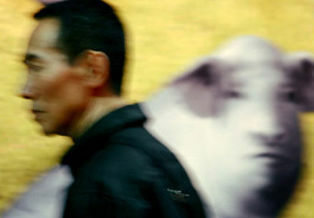 Lee has lectured at the Fogg Art Museum of Harvard University (2005), Maryland Institute College of Art (1997), Ithaca College, New York (1998); the Fashion Institute of Technology, New York (1990); the Beijing Central Art Institute (1986) and the Art School of Shanghai University (1984). His photographs are included in public and private collections such as the Brooklyn Museum of Art, New York; the Shanghai Art Museum; the National Museum of Art, Taipei Fine Art Museum and Kaohsiung Museum of Fine Arts, Taiwan; the New Mexico Museum of Fine Arts; the Musee de la Mode de la Ville de Paris; Landes Museum in Linz, Austria; Busan Museum of Art, Korea; Merck & Co., Seattle; Wellcome Collection, London and Documanta, Kassel, Germany.